of indeterminacy in Knowledge Engineering are proposed. Neurocybernetical, based on simulation of activity of a human brain as sets of interacting neurons. Each of these approaches has the advantages and lacks. First of them deal with simulation of surface thinking, from programming of heuristics in 50 years on an example of a solution mainly of game and mathematical tasks to construction of classical models of expert systems in 70-80-th of years [1, 2]. But all history of development of this approach, based on formalizing of knowledge, is connected with wish to deepening of this knowledge, and simulation more depth processes in mind, than simply of mechanisms of manipulation by the character information. To these attempts it is possible to refer representation of fuzzy knowledge with the help of linguistic variables , of pseudo-physical logic etc. This path of perfecting of simulation of brain activity it is possible to name as simulation “from above downwards”. A virtue of this approach is the relative ease of understanding and explanation that happens in an intellectual system at a solution of the task, since. The explanation is based on verbalization, naturally naturally realizable in such systems. A principal shortage is surface of thinking, i.e. lack in it creative component or incite, and also, the sequential performance of thinking. Neurocybernetics from the very beginning deal with simulation of the most depth processes which are flowing past in a brain of the man or an animal. It is possible to tell, that as against the first approach neurocybernetics deal with the simulation of subconsciousness, on which is based in main creative activity. A shortage of this approach is the lack verbalization during a solution of the task and, therefore, difficulty of understanding, how the task is solved and whether it is possible to trust to the obtained solution enough. In a direction of liquidation of this shortage researches, in particular, on creation of ansamble neural networks (Kussul and Amosov) now are carried on, in which the band of neurons associates with abstract concept, used in verbalization. It is possible to name this approach as simulation of brain activity “from below upwards”. Per the last decade the operations on confluence of these two approachs in one system joining a neural networks and classical Expert models are carried on. The concept of such systems has received a title of "hybrid" expert systems [4, 5] or “two hemisphere” Expert Systems. The concept last is offered and develops by the author . In this report the attempt is done to construct the model joining of two above indicated approach. This model can become a basis for development and research of “two-semi-sphere” intelligent systems, proposed by author. F (K, D) — the function of map K on D.
f (K, A) — map of a set of signs to a set of operations (in the elementary case it — one-to-one correspondence having place in natural intellectual systems as conditional and unconditional reflexes). Thus the set of images K can be divided on static and dynamic and into homogeneous and heterogeneous images. Strictly speaking, the static images do not exist at all in the real world. However, for simplification of representation and handling of knowledge it is useful to consider separately images, which do not depend essentially on time and to consider as their static. In (1) the relation F (K, D) to divide on two relations is possible: FR (K, D) — map of images on signs and FA (D, D) — map of signs to signs. The latter is identified with usually considered methods by representation of knowledge in Knowledge Engineering — by semantic nets, networks of the frames, rules etc., with which the every possible methods of the inference, including, fuzzy inference deal. It is possible to identify relation FR (K, D) with conversion of images in signs (coding or pattern recognition), producible, in particular, in artificial neural networks. That fact is a little less obvious, that it is possible to select one component in F (K, D), ration, defined on a set of fuzzy images of the exterior world, FF (K, K). This ration is formed during handling acting from the environment through receptors of the information and is exposition of the associative memory, obtaining as a result of it, basis for figurative thinking. On the other hand brain is possible to present (fig. 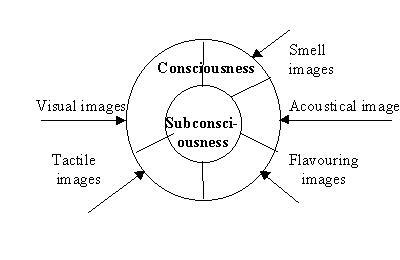 2) as the kernel responsible for subconscious thinking, and set of sensory analyzers (visual, acoustical, tactile etc. ), the process of thinking in which is realized as сonscious, since is immediately connected to activity of receptors. 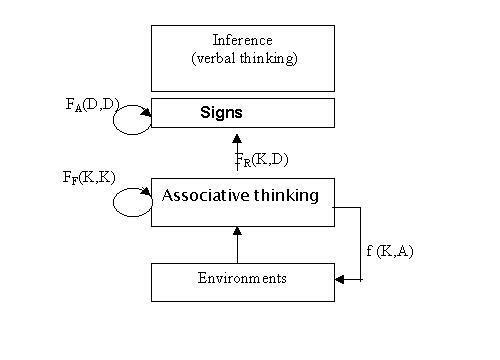 The maps FA (D, D) and FR (K, D) - basis for verbal thinking, concern to area of consciousness, and to its small part connected to the acoustical analyzer. All remaining areas of a brain are engaged in figurative thinking (realized in subconscious). It is known, that at meditation the man disables consciousness and sense organs, i.e. the process of thinking is saved only in the kernel. It allows a brain to wake the process of searching of associations, free from limitations connected to logical thinking and to associations, stored in sensory analyzers circumscribing concrete images (of a situation). In this case at return on a conscious level of thinking there is an effect "insite", i.e. the knowledge in a brain occurs as though "in itself". The similar processes can take place in artificial intelligent systems constructed in "two-hemisphere" architecture . While at implementation of neural networks we deal with simulation of subconsciousness (developers further implementations of conditional reflexes and associative data processing at a level visual etc. analyzers) practically have not advanced. At implementation of systems based on knowledge, the consciousness at a level of logical thinking (with fuzzy logic as attempt to reduce associative parallel processes to the sequential inference). Principle of indeterminacy in Knowledge Engineering. The will more precisely be recognized (interpreted) the structure of an image, i.e. its internal semantics, the will less precisely be recognized its interaction with other images (its external semantics) and on the contrary. This principle of indeterminacy means, that any intelligent system can not equally well understand syntax of images and in their semantics or, in other words, it is impossible simultaneously study deeply structure of plant and its correlation with other plants. Or, in other words, in that degree, in which developer (user) of a system gives the large attention to representation and discernment of details in structure of plants (concepts), he is forced to bypass by attention representation and discernment of correlation between them. This principle works as at formalising of knowledge in engineering process of an intelligent system, and at its usage during interpretation (application) of knowledge. Depth reason of a principle of the Heisenberg just as by a reason of the above formulated principle is the fact of unity observed both spectator and necessity of their reviewing as uniform system. And with reference to an intelligent system not the essence is important who (that) is by the spectator of knowledge - the interpreter of knowledge being its part or the exterior spectator (the user or the developer). Probably, this analogy between an image and elementary particle is not random. Not the gift, in  formulated analogy between the hologram and image in biological memory, and the process of recollecting has properties similar to properties of the process of restoring of the hologram. The concepts, offered in at present paper, and models can be used as a basis for further development of the theory of intelligent systems. Its development will allow to develop expert systems and intelligent robots, the process of reasoning in which is more approximate to what takes place in a brain of the man. Thus by a key problem, which should be solved and above it the operation is now carried on, is the simulation of the process of passage from signal representation of an image to its signed representation and back in learning process or, in other words, interaction between different neural networks or neural networks and classical expert systems. This investigation is partially maintained by the grant of Russian Federation on a direction "Computer science and cybernetics". Nilson N. Principles of an artificial intelligence. – Tioga Pub.Co., CA, 1980. Building Expert Systems. Edited by F. Hayes-Roth, D.A..Waterman, D.B. Lenat. – Addison-WesleyPub.Co., 1983. Zadeh L.A.. The Concept of a linguistic variable and its application to approximate reasoning. – Elsevier Pub. Co., N.Y.,1973. Honavar, V. Toward Learning Systems That Use Multiple Strategies and Representations. In: Artificial Intelligence and Neural Networks: Steps Toward Principled Integration. Honavar, V. and Uhr, L. (Ed.) New York: Academic Press, 1994. - Pp. 615-644. Honavar, V. Symbolic Artificial Intelligence and Numeric Artificial Neural Networks: Toward a Resolution of the Dichotomy. Invited chapter. In: Computational Architectures Integrating Symbolic and Neural Processes. Sun, R. and Bookman, L. (Ed.) N. Y.:Kruwer, 1994. - Pp. 351-385. Gavrilov A.V. The Model of mind / Int. Symp. "BIOMOD-92", S.-Peterburg, 1992. Ackoff R.L., Emery F.E. On Purposeful Systems. – N.Y., 1972. Pribram K. The Languages of the Brain. – Englewood Cliffs, N.J., Prentice-Hall, 1971.